Natcore Technology scientists have created a black silicon solar cell with an average reflectance of 0.3%, making it the “blackest” solar cell ever designed. 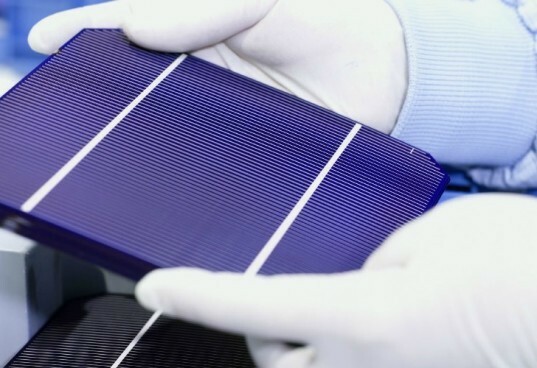 Compared to the most efficient solar cells currently on the market, Natcore’s development offers a tenfold decrease in reflectance over the solar spectrum. The result is an increase in energy efficiency that could help solar power compete even more effectively with traditional fossil fuels. The scientists formed the black surface on silicon wafers using a relatively simple liquid bath process. The porous wafer surface revealed almost no reflectance, which usually decreases the efficiency of solar cells. Near total “blackness” is important for solar cells, because when less light is reflected more sunlight can be converted into electricity. Black silicon solar cells are capable of producing more energy than conventional cells in a range of situations – the cells are more efficient in the morning and afternoon when the sun shines at an angle, and they also outperform cells with current antireflective technology on cloudy days. The difference could be even greater in large-scale solar installations. The New Jersey-based company was granted an exclusive license recently by the U.S. Department of Energy National Renewable Energy Laboratory (NREL) to research and market a line of black silicon products using NREL patents. NREL had lowered that reflectance ratio to two percent, but Natcore has pushed it to almost zero. Now the company is working with two equipment managers to design a manufacturing tool and already has prospective customers in Europe and Asia. Not only could solar power become more efficient, but there are environment benefits as well – Natcore’s process does not rely on any hazardous chemicals.